Low-alcohol beers that are suitable for extended drinking sessions, i.e. session beers, are challenging to brew. Their reduced grain usage makes them prone to wateriness. They're easy to overpower with hops, fermentation flavors and carbonation. Their shelf lives are short and their low levels of alcohol make them easy targets for contaminating microorganisms*. It's become conventional wisdom in the U.S. that brewers should decrease the wateriness of session beers by mashing (mixing the grain and water) at higher temperatures. Doing so increases the ratio of unfermentable sugars to fermentable sugars, which results in higher final gravities, but I disagree that it's a good way to build body in session beers. I don't want to get into heavy brewing geekery here, so I'll keep my reason simple: I've never brewed a wonderful session beer by doing so. For me, high mash temperatures always lead to a syrupy viscosity that reduces drinkability without making the beers more interesting. 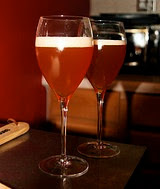 The best session beer I've made, by far, was my first batch of House Ale. I intended to follow the "mash high" advice of my peers, but I accidentally mashed at a slightly lower temperature. However, because I had recently switched base malts, the beer was also stronger than I was shooting for (4.2% abv instead of 3.5%). How much did each variable influence the beer's deliciousness? We may never know. For my second batch of House Ale, I reduced my grain usage and mashed at the designed high temperature. I hit the target alcohol content and the beer tasted ok, but it wasn't nearly as excellent as its predecessor. A syrupy character was present, as were watery undertones, and the beer didn't invite me to drink more. I'll be brewing House Ale #3 on Friday, and I'm going to mash at a medium temperature this time around. I reduced the amount of caramel malts in the recipe and added a bunch of Munich malt, which I believe will increase the malty backbone more than a high mash temperature. Stay tuned to find out how it works! In other news, the Chocolate Porter turned out very nice. It's flavorful and has a light body, but it's not watery at all. It has a relatively low alcohol content (4.8% abv), but I wouldn't consider it a session beer. It'll be tough to decide whether the Chocolate Porter or the Cardamom Coffee Stout will be the pub's year-round dark beer. *I'm talking about organisms that can ruin a beer's flavor, not make you sick. No known pathogens can grow in beer because the pH is too low and the alcohol content is too high (even in session beers). Your comment on the high-mash-temp/syrupiness is so right on I really wish I could give you a high-five via the wi-fi. I've noticed this a LOT lately and I'm glad you've finally pinpointed the "conventional wisdom". It might just be a mutual preference for "drier" (more fully fermented) beer, but it always just seems that "low alcohol", especially for ales, just means, too sweet and syrupy.